Leopold estimates he has touched the lives of about 10,000 law students over the years. 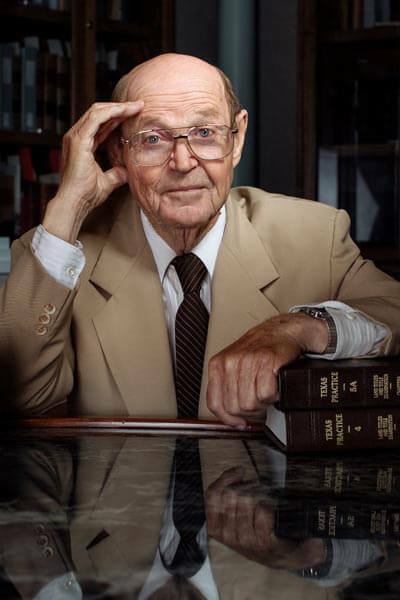 Since graduating from St. Mary’s School of Law in 1962 and joining the faculty in 1967, Leopold has spent 48 years perfecting the craft of teaching law and shaping minds into tomorrow’s legal leaders. Leopold, 81, was named Professor Emeritus and Senior Professor of Law this spring. Though he was a natural at teaching, Leopold’s path into the classroom was not traditional. Leopold grew up on a cotton farm in Nada, worked on a construction crew, was drafted into the Army for two years and briefly ran a lumberyard, all before entering law school. When he began his legal studies, he had not yet earned a bachelor’s degree; instead, Leopold used credits from Assumption Seminary and the assistance of Brother Tom Treadaway, S.M., who was the University’s registrar, to get into law school. He had already been a law professor for several years before he earned his bachelor’s degree in History. Ernest Raba, Dean of the law school during Leopold’s studies, tried to give him a job teaching property law after graduation. Leopold said he did not yet know the field well enough, and that he wanted to work for five years first. Five years later, to the month, Raba visited Leopold at his office to ask again to join the faculty. That time, he accepted. He advises law faculty to excel by knowing their subject matter and finding a teaching method with which they’re comfortable.